JD Wetherspoon500,000 have been printed for Wetherspoon’s 920 pubs. JD Wetherspoon is launching a second anti-European Union beer mat ahead of Thursday’s referendum on Britain’s membership of the 28-nation bloc. CRONYISM IS BAD FOR BRITAIN — a few questions for George Osborne. You say that you won the economic argument. Many strongly disagree. Democracy leads to prosperity and freedom — and the EU is increasingly undemocratic, with awful results in Greece, Spain and Portugal and 15 years’ stagnation in Italy. Our European friends are being dragged down by Brussels’ bureaucracy. I think that you are relying too much on cronies, whose organisations did not predict the last downturn and who don’t realise what they don’t know. 1. You officially nominated your friend (in January) Christine Lagarde, as head of the IMF. 2. The OECD is funded by the EU, and you are a friend of its head — Jose Angel Gurria. 3. You, George Osborne, are the boss of HM Treasury. 4. You employed Mark Carney, Governor of the Bank of England. Does the nation not deserve more independent advice? JD WetherspoonThe new Wetherspoon’s beer mats, front and back. 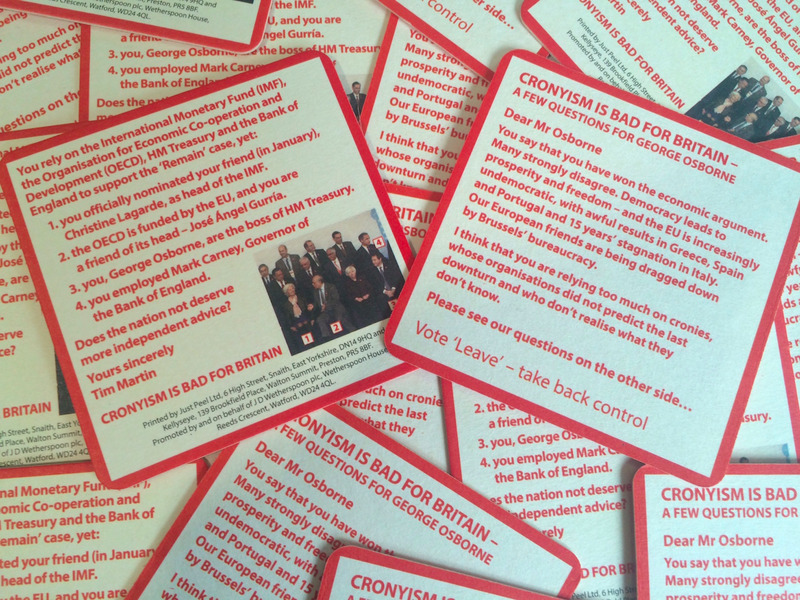 All of the bodies named in Wetherspoon’s message have warned of the negative effects of a so-called Brexit — Britain’s exit from the EU. The IMF has said it could cause “severe regional and global damage”; the OECD estimates Britain’s GDP would be 5% lower than it would be otherwise by 2030 if we opt to leave; the Treasury believes the GDP damage could be as bad as 7.5%; and the Bank of England Governor Mark Carney has warned a Brexit could tip the UK into recession. 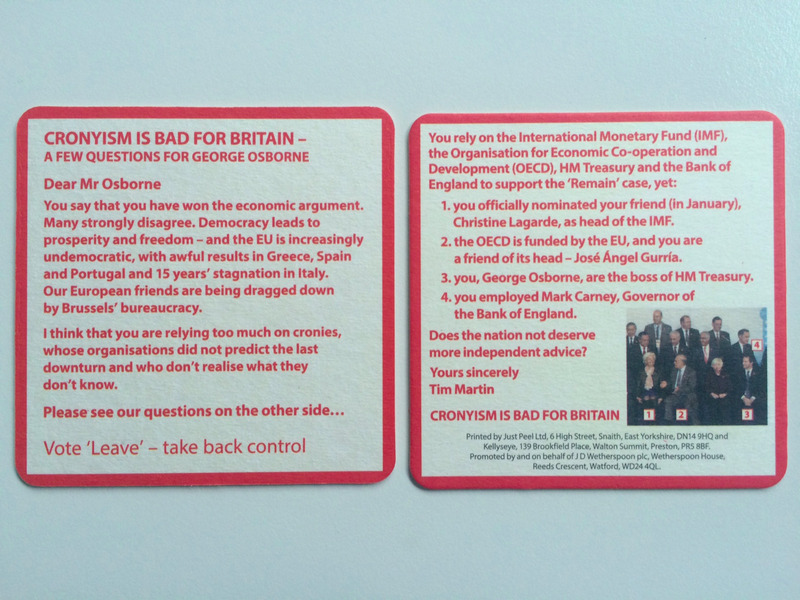 Tim Martin is a vocal opponent of the EU and it is the second time JD Wetherspoon has used beer mats to try and sway the vote in favour of “Leave.” Last month the pub chain printed 200,000 mats for its pubs attacking IMF chief Christine Lagarde and urging drinkers to vote out of the European Union. In an interview with Business Insider at the beginning of June, Martin told us that his opposition to the EU is because it is undemocratic.